Confessions of a Single Parent Pessimist: Mother's Day Creative Ideas & A FREE CARD! 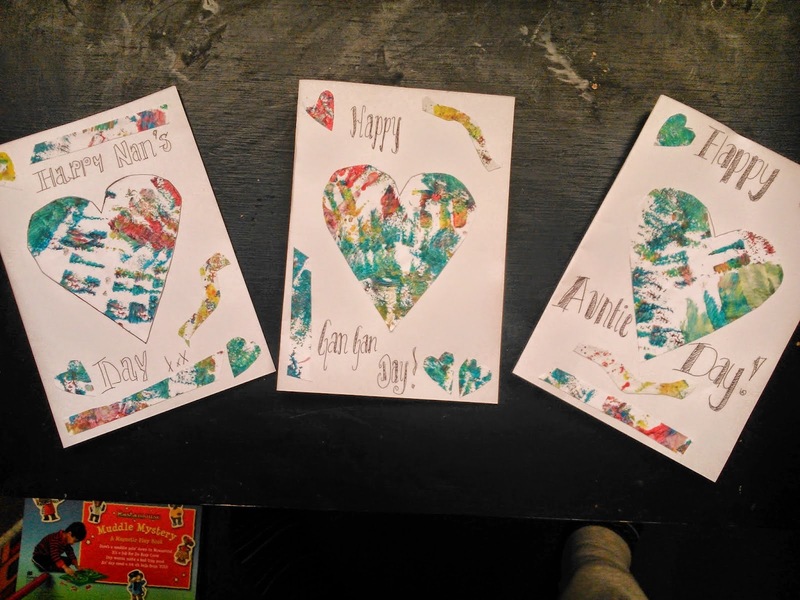 Mother's Day Creative Ideas & A FREE CARD! Mother's Day is upon us again (already?!) and I like to be creative rather than cash happy not only because I'm broke, but because I think it means so much more when a gift is made for you. So when I found out that Truprint are running a Mum in a Million campaign which includes giving away 1 MILLION personalised Mother's Day cards, I got to work creating one! I created a card from Chunk and Curly for their nan, which included a gorgeous photo of them both in their dressing up outfits, but due to my mum occasionally reading this blog I can't show you yet! If you want to grab a free card, simply design the card on Truprint and then at the checkout use the code MUMINAMILLION and it will deduct it off your total. Postage is 99p, but I got a lot of other items at the same time so was impressed with the price. Last year I made cards for all the females in my family using cut outs of pictures Chunk painted (see how I did it here). So this has inspired me again for this year too! Last year's Mother's Day cards Chunk and I made! I love Chunk to paint and draw things because these really are priceless and make great gifts for his nan, great nan and auntie. I'm thinking about doing some handprint/footprint pictures in the shape of a heart, watch this space! I have ordered a special photo block from Truprint featuring a photo of Chunk as his gift to his nan, and this is basically a photograph in a clear, rectangular box. I think it's a unique spin on a framed photo and is something his nan has never had before. I've also ordered in a huge bulk a lot of photographs from this last year that I may turn into a collage. Truprint were doing a great deal on prints so I ordered more than 400 and paid hardly anything! They also have personalised keyrings, mugs, place mats and much more which would also make some great, unique gifts for any mum or nan out there. To see their range go to their Mothers Day section here. Truprint provided me with a personalised Mother's Day card and some photo prints for the purpose of this post. No payment was given and all opinions are honest and my own. Fabulous! Thank you for sharing! Both me and my mum love personalised gifts such as photos too!